Looking for new ways to heat your home? 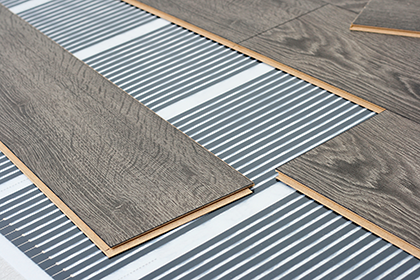 Underfloor heating (UFH) could be the solution for you. As well as an absolute treat for you feet during the cold winter mornings, it’s a great space-saver as well as an energy-efficient way to warm up your household. There are no radiators to spoil the clean lines of a room, and space can be saved by freeing up a wall that would otherwise need to be dedicated to a radiator. Underfloor heating is also an extremely efficient way to warm a room, and gives a more pleasant heat than radiators, stoves or traditional solid-fuel fires. Heat is emited in a very gentle way. There are no cold spots and, as most of the heat is concentrated in the lower part of the room, very little heat is wasted. Underfloor Electric heating mats and underfloor heating wire systems Electric systems feature cables which are attached to open-weave mesh mats. There are, however, newer types where the elements are embedded into a continuous roll. The mats or rolls are spread out on the floor, connected together and are then linked up to the thermostat and mains power supply. In general, whilst electric systems are cheaper to install, and cause less disruption to existing floor structure, they are more expensive to run than wet systems, which are more cost efficient however this may not be possible for your type of installation. We use only trusted suppliers for our under floor heating materials and also include both floor and air temperature settings so you can get your room just the right temperature to suit you. The thermostats we use can also be wirelessly controlled via your mobile phone.